Product Consist: Bio Care Whitening Face Wash (Weight: 150 ml), Twin Shade Heart Shape Cushion (Approx Size: 8 Inch), Personalized Message Bottle (Special Instruction: Personalized Text Message for MOM accepted maximum 25 characters only) along with Paper Bag. Send fantastic surprise to your mom on this Mother's Day with this appealing Amazing Hamper for MOM from Giftacrossindia. Mothers are the world’s great unsung heroes, always there to make the rest of the family feel special, 365 days of the year. So here’s your chance to show your gratitude and treat her like a queen. Put her up where she truly belongs on a pedestal, with adoring family at her feet and a glass of something refreshing in her hand. If your mom loves the cushion then she appreciates it. This Scroll Bottle gift is perfect for gifting someone special or for you to keep your mini secrets. Also a unique way to say Happy Mother's Day. Bottle use for personalized your own custom text message up to 25 characters. A bottle made of crystal clear glass is matched with an eye catching cork. 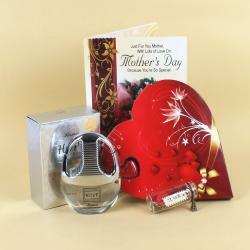 This gift will bring sweetness to your life and relationship will make it strong and best for giving on Mother's Day. Send skin care gifts for her which are sure to bring a smile on her face on any gifting occasion as like mothers day from Giftacrossindia. Gift this to your mother on this mothers day and show that you care about him. So, go ahead book your order now. Product Consist: Bio Care Whitening Face Wash (Weight: 150 ml), Twin Shade Heart Shape Cushion (Approx Size: 8 Inch), Personalized Message Bottle (Special Instruction: Personalized Text Message for MOM accepted maximum 25 characters only) along with Paper Bag.